Tea became a popular commodity in Europe by the early seventeenth century, brought over from the East by Dutch and Portuguese traders. 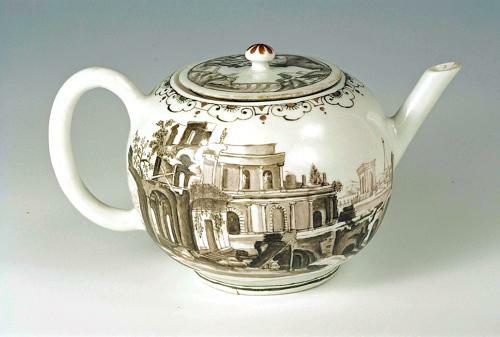 The major European porcelain factories, including Du Paquier in Vienna, shortly there after began to produce a variety of teapots and other teawares such as sugar boxes, slop bowls, tea flasks and tea bowls, to satisfy the demands and tastes of noble and merchant clients. Teawares were some of the earliest documented pieces produced at the Du Paquier factory and they continued to be made throughout its history. This teapot is made to a classical Chinese model and its form was also produced at Meissen, first in Böttger stoneware and later in porcelain. Its decoration, known as Schwarzlot, or black monochrome, was one of the most popular modes of ornamentation at Du Paquier. Much Schwarzlot decoration was taken from European engravings or represented scenes inspired by East Asian themes. Schwarzlot closely imitated the linear style and cross-hatching of the printed scenes in which the pieces were based as well as the subject matter.